In late 1937, Mitsubushi purchased two NA-16s as technology demonstrators and possibly a licence. However, the aircraft developed by Watanabe/Kyushu as the K10W1 (Allied code name Oak) bore no more than a superficial resemblance to the North American design. It featured a full monocoque fuselage as opposed to the steel tube fuselage of the T-6 and NA-16 family of aircraft, as well as being of smaller dimensions overall and had no design details in common with the T-6. It was used in very small numbers by the Imperial Japanese Navy from 1942 onwards. None survived the end of the war, and after the war, the Japanese Air Self Defense Force operated Texans. 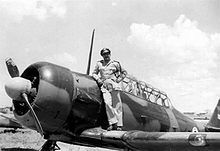 Twenty AT-6 Texans were employed by the 1st and 2nd fighter squadrons of the Syrian Air Force in the 1948 Arab-Israeli War, providing ground support for Syrian troops, and launching air strikes against Israeli airfields, ships, and columns, losing one aircraft to antiaircraft fire. They also engaged in air-to-air combat on a number of occasions, with a rear gunner shooting down an Israeli Avia S-199 fighter. During the Korean War and, to a lesser extent, the Vietnam War, T-6s were pressed into service as forward air control aircraft. These aircraft were designated T-6 "Mosquitos". On 16 June 1955, rebel Argentine Navy SNJ-4s bombed Plaza de Mayo in Buenos Aires, Argentina; one was shot down by a loyalist Gloster Meteor. 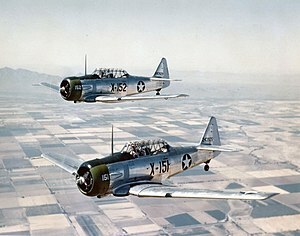 Navy SNJ-4s were later used by the colorado rebels in the 1963 Argentine Navy Revolt, launching attacks on the 8th Tank Regiment columns on 2 and 3 April, knocking out several M4 Sherman tanks, and losing one SNJ to anti-aircraft fire. T-6s remained in service, mainly as a result of the United Nations arms embargo against South Africa's apartheid policies, with the South African Air Force as a basic trainer until 1995. They were replaced by Pilatus PC-7 MkII turboprop trainers. The Harvard 4 has been used in Canada as a testbed aircraft for evaluating cockpit attitude displays. Its aerobatic capability permits the instructor pilot to maneuver the aircraft into unusual attitudes, then turn the craft over to an evaluator pilot in the "blind" rear cockpit to recover, based on one of several digitally generated attitude displays. Since the Second World War, the T-6 has been a regular participant at air shows, and was used in many movies and television programs. For example, converted single-seat T-6s painted in Japanese markings represent Mitsubishi Zeros made appearances in A Yank in the R.A.F. (1941), Tora! Tora! Tora! (1970), Baa Baa Black Sheep (1976-1978), and The Final Countdown (1980). In A Bridge too Far (1977) it represented the razorback Republic P-47 Thunderbolt. Some were modified for the Dutch film Soldaat van Oranje (1977) to represent the Dutch pre-World War II fighter Fokker D.XXI. The T-6 also appeared in the Pat Benatar video for Shadows of the Night. The New Zealand Warbirds "Roaring 40s" aerobatic team use ex-Royal New Zealand Air Force Harvards. The Flying Lions Aerobatic Team uses Harvards acquired from the South African Air Force. On 23 October 2018 an AT6 painted in Second World War German air force markings used for mock dogfights for air shows and similar uses crashed on a southern California freeway while on a training flight, and was destroyed by fire. The pilot survived and there were no other casualties. This page was last edited on 21 April 2019, at 03:06 (UTC).